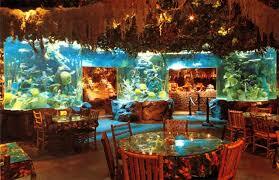 The only one of its kind in the UK, the Rainforest Cafe is a unique and exciting themed restaurant in Piccadilly Circus, London. Designed as an exotic jungle that recreates the sights and sounds of the Amazon rainforest, it is perfect for families, couples, groups or big kids. Take a seat on one of the Insta- famous animal barstools in the mushroom-themed bar. Experience strobe lighting, waterfalls and tropical fish tanks while enjoying a meal in the heart of central London’s Theatreland.